Pasta salads have their time and place. They flourish when the sun is shining, bathing suits are damp, and friends and family are gathered. Basically, pasta salad is a summer food. Searching for the perfect recipe for your summer gathering? You’ve come to the right place. My Miso Pesto Pasta Salad is sure to please everyone, whether they are vegetarian, gluten-intolerant, lactose-intolerant, or even meat lovers. 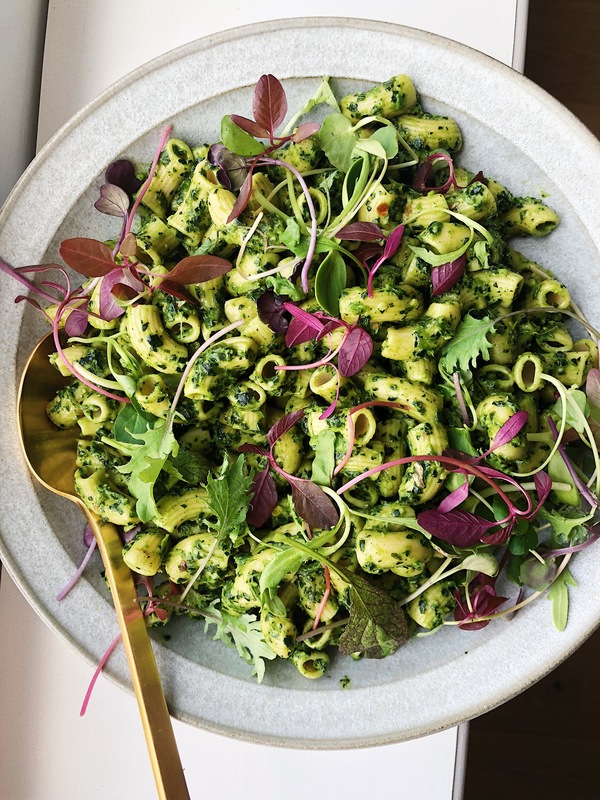 But what’s best is this recipe celebrates summer produce, making a pesto out of everything green such as kale, basil, and green onions. It’s definitely a fun spin on the classic pesto you are used to, with a delicious umami flavour from miso, instead of parmesan. You can use whatever type of elbow noodles you want. I’ve made this recipe with Banza chickpea pasta, and I’ve made it with Tinkyada brown rice pasta. I personally preferred using brown rice but choose what works for you. When making a pasta salad you want to make sure you don’t undercook the noodles, it’s better to cook it past al dente but before it’s mushy. I recommend cooking it a minute past the recommended cooking time. This is important because it’s meant to be served at room temperature, and pasta hardens as it cools. Cook noodles according to package instructions. Drain, rinse under cold water, and set aside. Pulse toasted almonds in food processor until roughly chopped. Add remaining ingredients (minus the micro-greens if using). Pulse until finely chopped. Transfer to bowl and thin out with a bit of olive oil, about 2 tbsp. Season with salt. In a large bowl combine the noodles and pesto. Season to taste. Serve as is or topped with micro-greens. Best served same day at room temperature. *To toast almonds, scatter raw almonds on a baking sheet and set oven to 350°F. Toast for 7-10 minutes until fragrant and golden. Cool completely before using. This entry was posted in Salads and tagged brown rice pasta, chickpea pasta, easy recipe, farmers market, gluten-free, green food, green living, green onions, kale, pasta salad, pesto, plant-based, summer, summer salad, Vegan, Vegetarian, whole foods. Bookmark the permalink.